Photo by Amy Bartlam9. 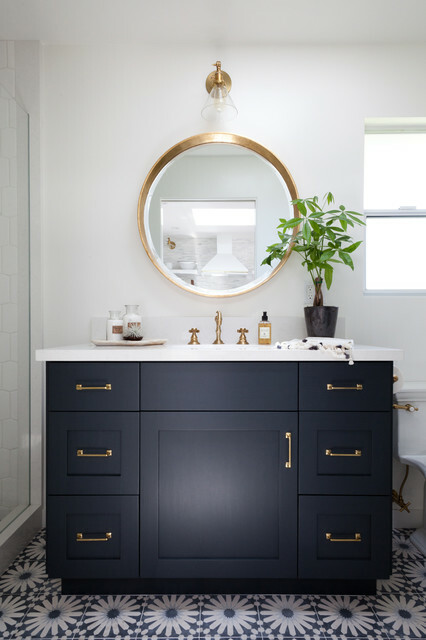 Navy brass is goldenThe gold-hued brass details – wall sconce, mirror, tapware and cabinet hardware (if you look closely, even the toilet roll holder and the flush) – work so well with the navy-coloured vanity of this bathroom. Hotel-worthy displayHotels have a signature style that every room must adhere to, with the basin area displaying the same arrangement of accessories each day. Try to recreate this luxurious look by clearing away clutter into drawers or cupboards, and only displaying a few choice toiletries beside the basin.Tip: A smart tray for your bottles will help the arrangement feel consistent, just like in a hotel bathroom.